The real estate rebound that lifted property values around the world is losing momentum, Bank of Nova Scotia says in a new report. Housing demand and prices slipped in the second quarter, senior economist Adrienne Warne wrote in the bank’s Global Real Estate Trends Report Tuesday. The market was sideswiped by moderating global growth, volatility in financial markets and weak job creation. Sweden and Switzerland posted increases, while in Britain home prices moved back into positive year-over- year territory for the first time in two years. The U.S. and French markets reported marginal declines. Spain and Ireland saw home prices fall year over year in the quarter, with high inventories and high unemployment hurting the market. Japan, which has been in a 20-year slump, also saw prices slip. She expects Canadian prices to be “roughly flat” for the rest of the year. Canadian sellers have been asking for more money than new builders, the report added. 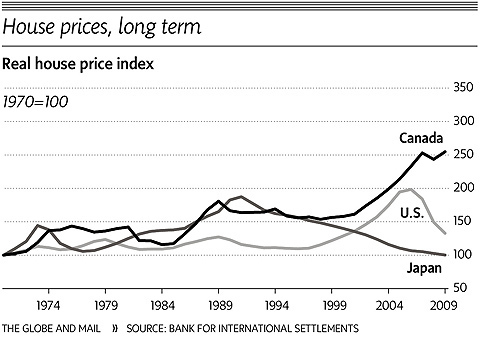 Between 2000 and the first half of 2010, the average cost of a new home increased by just over 50 per cent. “The divergence in new and resale home prices is seen in most markets across the country, but to varying degrees,” the report said.